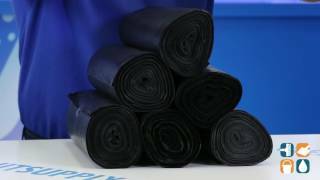 These high density garbage bags from Flexsol are intended for use in areas that collect non-sharp objects, such as bathrooms, kitchens and classrooms. These super heavy duty 45 gallon black plastic can liners offer an ideal combination of low cost and high quality. Equipped with high density resins, these bags provide an excellent gas, moisture and odor barrier and are 100% recyclable. Constructed of high quality materials, these leak proof trash bags provide exceptional load capacity compared to other similar garbage bags. Packaged in coreless rolls, Flexsol 45 gallon garbage bags allow for easy storage and dispensing. Best of all, CleanItSupply.com offers them at the lowest prices around. Stock up today!